On a blue background, an orange goldfish jumps from it's bowl of water on the left of the image to the upper right. On the bottom, there is a darker blue rectangle with the title in small, white words and the name of the author in a lighter blue across the bottom. Melody, a brilliant eleven-year-old with severe Cerebral Palsy, receives an assisted communication device. With the ability to voice her thoughts for the first time, she tries out for the school quiz team. But not everyone is glad Melody can participate. I loved Melody! She’s funny, smart, and complex. She longs for all the things “normal” kids have without falling into total pity and despair. She loves her family intensely. Melody is surrounded by people who want her to succeed. Her parents are fierce in their love for her, advocating for her. Her neighbor babysits for her and her baby sister, and is one of her first major allies. A new aide at school helps open up her world. But, for everyone who is good for Melody, there are people who dislike her. There are teachers throughout her life who make things harder on her. Students in her integrated classes make fun of her. The first eleven (or so) chapters of the book are like short stories of Melody’s life. One is about the goldfish she lost. Another is about her mom’s pregnancy and the fear her baby sister would be disabled, too. The chapters follow the order of Melody’s life, so the reader is able to perceive her growing up. The settings are okay. They aren’t overly descriptive, they just have enough detail for a reader to visualize them. Even though this book is for “kids”, I had no trouble relating to it. The author doesn’t over-explain or gloss over the more difficult aspects of Melody’s life. In one scene, Melody’s quiz team goes out to eat at a restaurant. The handicapped-accessible entrance doesn’t work, so Melody has to be maneuvered up the steps outside by her mother. Once inside, her teammates make conversation with each other, without involving her. Melody dreads eating in front of her peers because she needs assistance and doesn’t want them to see. It is an uncomfortable scene, but an honest one. A couple of minor plot points felt like they didn’t really lend much to the story, but that’s all I can really say in regards to negatives. I got teary-eyed twice reading this book, the first time being when Melody was finally able to tell her parents she loved them using her device. I also smiled and became angry at different parts. What happens to Melody before the national quiz competition wasn’t shocking, but was infuriating nonetheless. This is definitely a worthwhile read. Author Biography: Sharon Draper is a two-time Coretta Scott King Award-winning author, most recently for Copper Sun, and previously for Forged by Fire. She's also the recipient of the Coretta Scott King/John Steptoe Author Award for New Talent for Tears of a Tiger and the Coretta Scott King Author Honor for The Battle of Jericho and November Blues. Her other books include Romiette and Julio, Darkness Before Dawn, and Double Dutch. She lives in Cincinnati, Ohio, where she taught high school English for twenty-five years. She's a popular conference speaker, addressing educational and literary groups both nationally and internationally. 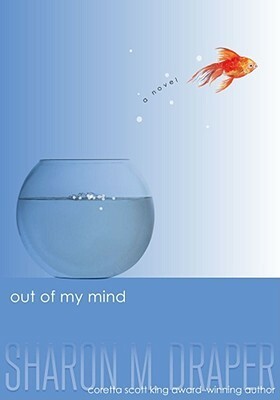 There are books where (I wish) I could spoil the entire plot because I want to tell you so badly what scenes caused me to love (or hate) a novel. I’ve also thought about live-tweeting a book. Maybe someday. A quick note: After today, this blog will be on hiatus until June or July. I have a lot of things going on in my life right now, and I don’t have anyone I trust to take the reins while I’m gone. I will still be on Twitter and checking my email.